"This is a loan that the banking sector will pay back on its own, and we have to celebrate the fact that our European partners have helped us." You can read our take on Rajoy's attempts at spinning the bailout here. 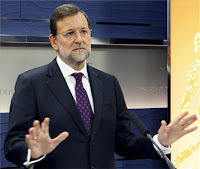 But the Spanish Prime Minister also revealed to the parliament that he has written a letter to European Commission President José Manuel Barroso and European Council President Herman Van Rompuy. The five-page letter is dated 6 June - i.e. three days before Spain officially sought financial assistance - and is available here. "It is essential that we, the European leaders, highlight our resolved and convincing commitment to the single currency. That is, we need to make clear that, in the medium term, the [monetary] union will strengthen its common institutional architecture. This undoubtedly means moving ahead with integration, or, if you prefer, a greater transfer of sovereignty, particularly in the fiscal and the banking domain." "In the fiscal sphere, this mean creating a fiscal authority in Europe, which can steer fiscal policy in the eurozone, harmonise the fiscal policies of the member states and allow centralised control of [public] finances, in addition to acting as a European debt agency." "In the banking sphere, it is necessary to rely on supervision at the communitarian level and a common deposit guarantee fund." "We do not need to decide now how we will do it. It is sufficient to show commitment to this objective and start working to achieve it." Well, if it is quite obvious for Spain to argue in favour of a single banking watchdog given the circumstances, the idea of a single fiscal authority in charge of supervising the national budgets of eurozone countries is actually a bold one - especially given Rajoy's previous unilateral decision to adjust this year's fiscal target without consulting eurozone leaders. Rajoy will discuss his plans with Merkel, Monti and Hollande in Rome next week, with a view to submitting them to all EU leaders the week after. The central fiscal authority will likely be music to the German Chancellor's ears, although doubts remain over how many eurozone governments (and voters) would be ready for such a massive loss of sovereignty. On a slightly separate note, the Spanish Prime Minister should probably get a grip on reality and stop thinking that the simple promise to do something will be enough to calm the markets - the Spanish package has shown anything, its that a promise of action but without details or clarity creates more problems than it solves. On the question of loss of sovereignty inherent in handing over control of banks, finance and much else to the EU in a (doomed) attempt to keep the euro afloat, I find it both astonishing and seriously worrying that George Osborne can simultaneously declare that such losses of sovereignty would be unacceptable for Britain - but is essential for euro members. Since when did British policy involve stamping on the faces of others to save ourselves? Surely Sidney Carton in A Tale of Two Cities sacrificed his life for a friend, not a friend for his life? The people who run the EU are divorced from reality. If you own someone's debt, and are think there is a risk to that debt, then the value of the debt drops and yields rise. If that someone's debt becomes bigger by borrowing more, the risk intensifies and the yields rise more. But if the new debt is 'senior' to yours, ie the new lender will be repaid before you are, then the risk is much greater and the yields soar. AND THEY DO SOAR, DON'T THEY?